The 'Ace of Spades' has been employed, on numerous occasions, in the theatre of war. In the second World War, the American 101st Airborne Army Division were marked with the symbol painted on their helmets. In this capacity, it was used to represent good luck, due to its fortunate connotations in card playing. All four card suits were used for ease of identification of regiments within the airborne division following the confusion of a large scale combat airborne operation. Battalions within the regiments were denoted with tic marks or dots, marked from top clockwise; Headquarters at the twelve o'clock position, 1st Battalion at the three o'clock, et cetera. This card reverse is roughly translated to mean "Death waits for the Viet Cong. Surrender or die!". Given that the concept for the band KISS drew upon comic book superheroes almost as much as upon music itself, they were a natural to feature someday in their very own comic. Sure enough, that came to pass in 1977 when Marvel Comics issued the first Super Special KISS comic book. The four members of KISS, Gene Simmons, Paul Stanley, Peter Criss, & Ace Frehley, allowed their blood to be drawn during a concert stop in New York at Nassau Coliseum on February 21st, 1977, and then they later flew up to the Borden Ink plant in Depew, New York, to be photographed adding their vials of donated blood to a barrel of red ink on May 26th, 1977. 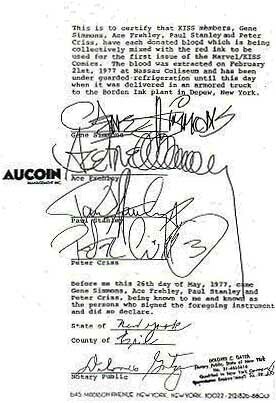 A notary public duly certified the authenticity of the process, and the notarized document was made available as the "KISS comic book contract". The Kiss Marvel comic book is released the same day as the band's "Love Gun" album, on June 30th, 1977, where its status among comic book collectors, as well as KISS fans, keeps in in high demand worldwide. The comic itself is 11 inches in height and 8.25 inches in width. In the late 1960s, the U.S. Defense National Stockpile Center, an arm of the Defense Logistics Agency, had over 165 million ounces of silver in its stockpile. The silver stockpile posed a serious threat to the market when government officials determined it was no longer needed and that domestic silver production combined with reliable imports could sustain the United States in the event of an emergency. The General Services Administration, an executive branch agency, attempted to sell the silver in the fall of 1981 through auctions, but the auctions were discontinued when bid prices fell below the market price of silver. In 2000, the last remnants of the stockpile were directly towards the mintage of U.S. Mint coins. All future silver purchases of the U.S. Government will be on the 'open market' as opposed to withdrawn from the stockpile. Originally housed at the U.S. Assay Office in San Francisco, California, the silver, .999 Fine, in this bar was smelted and minted in its present 10 Troy ounce size by the Continental Coin Corporation. This particular bar displays one of the two front die patterns of these bars. However, both die patterns are in the museum's collection. This pack was issued in November of 2005 to a select few. The presentation box contains a booklet called '8 Years in Oak' and an authentic piece from a cask that has aged whisky for 8 years.